I finished my commission with little time to spare. My friend Janet delivered it to Stratford after I had time to share with the Oakville Stitchery Guild at our monthly meeting. Janet said Carol Miller of THE QUILT, was pleased with our work. I am looking forward to seeing it in their catalogue and at the shows it is scheduled to be shown. Janet's piece was amazing! The best I've seen of her work! Bravo Janet! My friend Anne Marie introduced me to Cyber Fyber and I was able to make a ATC and Postcard trade with Susan Lenz who is curating this exhibition. I also joined Fiber Art Mixed Media or FAMM started by Susan Sorrell. What a cool place to hang out on the computer. I have several friends already. She makes amazing journals!!! And that's how I got connected to her Mixed Media class. That's all for now, I will catch up on the workshops I've taken recently! 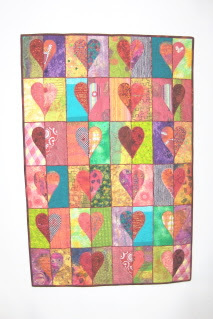 Well thank you for such kind words:) That intuitive heart quilt is fabulous! Donna... I spoke to you at our YorkShire Rose Guild Wednesday night. I cannot stress how wonderful your presentation was of your quilt history how you started and where you are today. I myself have not done fibre art and was not totally into it.. but I think you have just converted me into thinking outside the box just a little more. I think I will start with postcards first. All your quilts were exceptional and your explaination of each one really makes a quilter feel she was there and a part of our enthusiasm. Hope to see you teach a class at one of the Guilds in the Toronto Area.